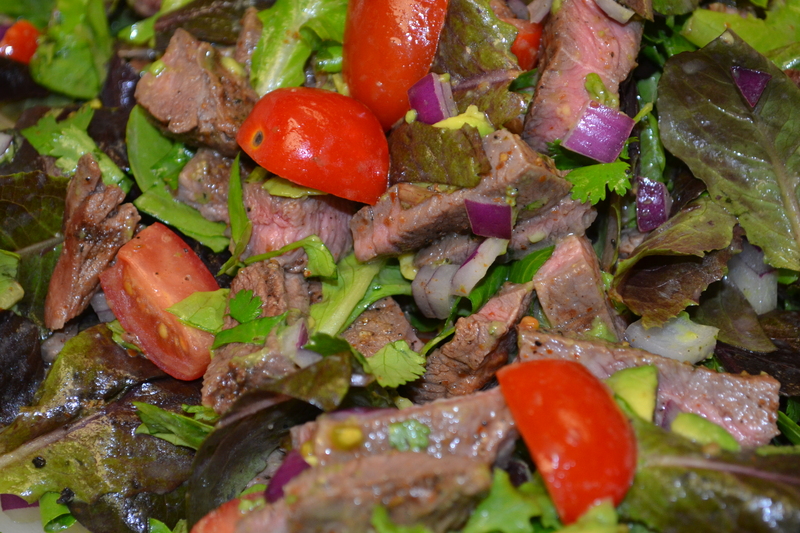 The other night Seth suggested we make a spicy steak salad-I do the salad and he does the meat. This works well for us when we’re in the kitchen: he’s the meat and I’m the fruits and veggies. Since we wanted some spice, Seth threw a couple different kinds of pepper in a grinder to get them very fine, then used this dry rub on the steak before grilling [warning, can be very spicy when finely ground!]. I typically use an organic herb lettuce mix, as most times, it contains cilantro (as well as a few other fresh herbs) anyway 🙂 I use kitchen shears to cut lettuce for any salad I make, it just makes it so much easier to eat when you don’t have those big hunks of lettuce that I hate! I tossed all of the veggies into a bowl and then threw in the cubed, fresh grilled steak, and dressed it in a light olive oil, lemon, and lime juice mixture. This entry was posted in Recipes and tagged Dinner, Grass Fed, Organic, Salad by livinglikelinds. Bookmark the permalink. Thank you! It was surprisingly spicy, and full of flavor, but the avocado gave it a nice balance! Here is another lovely summer salad! Reblogged this on Kim's Organic's Okc Blog.